Hurricane is the name given to tropical cyclones in the North Atlantic and East Pacific Oceans. In other ocean basins they are known as either Typhoons, Tropical Cyclones, or Cyclones. It is a storm system which consists of a low pressure centre and thunderstorms which features strong winds and heavy rain. In the Northern Hemisphere tropical cyclones rotate in a counterclockwise motion while in the Southern Hemisphere they rotate in a clockwise motion. In the North Atlantic and East Pacific there are four classifications of tropical cyclones. A tropical depression has a defined surface circulation with organised thunderstorm activity. Maximum sustained winds are less than 17m/s (33kt, 38mph, or 62km/h). A tropical storm has a defined surface circulation with well organised thunderstorm acitivity and maximum sustained winds are between 17-32m/s (34-63kt, 39-73mph, or 62-117km/h). A hurricane has maximum sustained winds equal to or greater than 33m/s (64kt, 74mph, or 118km/h). At this intensity a storm tends to develop an 'eye' which is an area of relative calm in the centre of circulation. A major hurricane is the term given to hurricanes with maximum sustained winds greater than 111mph. Hurricanes need heat and moisture in order to be sustained. For a tropical cyclone to form there generally needs to be six factors involved (however a tropical cyclone may still form without all six factors). In most cases water temperatures greater than 26.5°C (80°F) is needed at depths down to 50m (150ft). This causes the overlying atmosphere to be unstable enough to sustain convection and thunderstorms. Also, rapid cooling of the air is needed with height as this allows the release of latent heat which gives the energy to tropical cyclones. High humidity levels are needed in the lower to mid troposphere. Also low wind shear is needed so that the structure of the storm is not blown apart. Tropical cyclones also generally need to be greater than 5 degrees either side of the equator in order for the Coriolis effect to provide enough rotation. Finally a tropical cyclone needs a pre-existing system of disturbed weather. There must be some kind of circulation and low pressure centre. Tropical cyclones can form in any of the worlds oceans. They generally occur in the tropics but can also occur in the mid-latitudes. Due to the trade winds tropical cyclones generally track westwards and curve polewards into the mid-latitudes. The majority of tropical cyclones form between 10 and 30 degrees from the equator. The Intertropical Convergence Zone (ITCZ) is generally perceived as the main cause of formation. 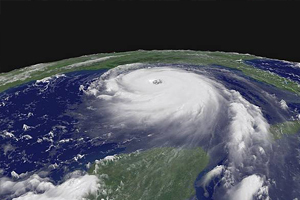 Katrina was the costliest and one of the deadliest hurricanes to hit the US. Severe destruction occurred in the states of Mississippi and Louisiana when Hurricane Katrina came ashore as a Category 3 hurricane on August 29th 2005. Around 80% of the city of New Orleans was flooded by the hurricane after the levee system failed. In total around 1800 people lost their lives and Hurricane Katrina caused more than US$81 billion of damage. One of the deadliest and one of the most powerful hurricanes on record in the North Atlantic. Maximum sustained winds reached 180mph and dumped an unofficial 75inches (1900mm) of rain on Honduras and Nicaragua between October 29th and November 3rd 1998. The deaths from this hurricane reached around 11,000 with 8,000 people missing. The second most destructive hurricane in US history. Landfalling as a Category 5 hurricane in Miami-Dade County, Florida, with winds of 175mph the hurricane caused 65 deaths and US$26.5 billion of damage (US$38.1 billion in 2006 prices). Devestated the Australian city of Darwin on Christmas Day in 1974. The tropical cyclone killed 71 people and caused $837m (1974 AUD) of damage. Tracy reached Category 4 on the Australian cyclone intensity scale and Saffir-Simpson Hurricane Scale with the last official recorded winds at 135mph before the aenometer was blown down. Unofficial estimated maximum winds are put down as 185mph, making it a Category 5 storm.